This is a rich dessert ideally served in expresso cups or small clear glass dessert cups. For a really special occasion, serve in chocolate shells. Decadent white chocolate and intense strawberry combine to make this one of your more memorable treats. Make it the day ahead for best results. Use a chilled bowl to whip the cream to perfection. Adrienne demoed this in May 2014. 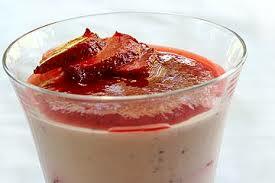 Puree the quartered strawberries in a blender or food processor; add 1 T lemon juice. Pass pureed strawberries through a fine-mesh sieve into a bowl, pushing down firmly so you catch as much of the puree as possible; you should have about 1¼ to 1½ cups. Reserve in the refrigerator; discard solids. In a double boiler or in a microwave-safe bowl, melt the 12 oz. chopped white chocolate. Put ¼ cup of cool water into a small bowl. Sprinkle the gelatin powder over the water and let sit for 5 minutes. Stir ¼ cup of the heavy cream, sugar and liqueur of your choice in a small saucepan, bring to a simmer over medium heat. Add the gelatin mixture and stir until the gelatin has dissolved. Pour into the bowl of melted chocolate, and stir until smooth. Whisk in 3/4 cup of the strawberry purée. Reserve the remaining purée. Using an electric mixer, whip the remaining 1 3/4 cup of cream. Beat on medium-high speed until medium peaks form. Whisk one third of the whipped cream into the chocolate mixture. Using a large rubber spatula, gently fold the remaining whipped cream into the mixture. Refrigerate for 1 hour. Stir the remaining 1 T of lemon juice into the sliced berries. Fold half the sliced berries into the mousse. Spoon mousse into serving cups and refrigerate several hours, or overnight (cover with plastic wrap). When you are ready to serve the mousse, smear some of the reserved strawberry purée onto each serving. Top with shaved white chocolate and a few slices of strawberries. This entry was posted in Desserts, Recipes from Adrienne's pantry and tagged chcolate, cream, gelatin, strawberries. Bookmark the permalink.